From East to West is an excellent work, with many good distinctive features. In the first place, one should mention the simple lineup, that alone enraptures and is a warranty of the high-quality of the album. The long-time consolidated Fioravanti-Bagnoli duo are a rhythm and melodic (who's writing is strongly convinced of the intrinsic melodic quality of the style of drummers such as Bagnoli) that leaves nothing to chance, where the structure of accompaniment is formed by a precise balance between expression and intention, that lends to the album richness, solidity and preciseness. On the other hand, the presence of such guitarist as Menconi isn't any less interesting, being he one of the most creative improvisers that Italy can boast and, as the tracks included in the album demonstrate, an intelligent composer as well. 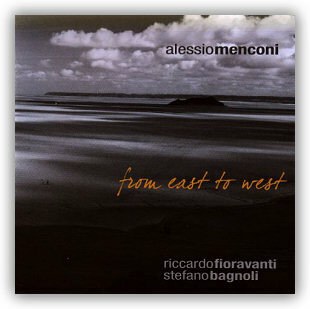 Menconi's guitar, with its warm sound full of pathos, is certainly the distinctive feature of this work. What strikes about this artist is his getting carried away and at the same time his ravishing, even with few penetrating notes. Most surprising is the expressive sensibility with which he builds a monologue that seems directly addressed to the listeners; astonishing is the way he avoids technique as an end in itself in favour of a deep approach to the track and its lyricism. Another important and very evident feature is the trio's choice to stay tied to their classic background without sacrificing the possibility of original ideas, though this doesn't lead to any exasperated quest for novelty and for something never-before-heard. The movements, the dynamics and the exchanges are easy and free: the form is modern. Paradoxically, despite the overall sweetness of sound and the fluidity of the tracks, the trio's work echoes fusion and jazz-rock. One can perceive a tension emerging from within the sound texture, especially in the solo moments, that creates a good contrast with the sweet languor characterizing the whole album. If Menconi's most genuine style appears through the four tracks of his composition, among which "Venti Alisei" absolutely deserves a special mention, the trio's creative freedom is expressed at its best in non-original tracks, like an unexpected version of "The Fool on the Hill" by the Beatles and the wonderful "Romeo e Giulietta" by Nino Rota. A short but beautiful moment is "Azbi", by Fioravanti, consisting of a simple exchange of theme between guitar and bass, dominated by a suspended and a bit gloomy sound, able to touch the listener's soul. The last composition, "Bandeyer" by Bagnoli, is a sort of sudden reversal, having a more pronounced rhythm, and it's clear that it could only be his. The end of the song - and of the album – is simply brilliant: in contrast to the previous tracks and their more indefinite sound, it seems to convey the above mentioned tension, concentrate it and thicken it, as if to suddenly counterbalance the whole set up of the album. In short, From east to west has got what it takes to be considered one of the best productions of the year.